Zipped bag with label for washing horse and pet items to help prevent hair damaging the washing machine or blocking drains. Hair shakes out after washing. When washing items covered in pet hair, the hair can damage the washing machine and block drains. This wash bag traps the hair, which is easily shaken out after washing. Suitable for horse hair and course dog hair. For washing all pet items or clothing and especially useful for riding stables with daily wash use. Large size should be adequate. 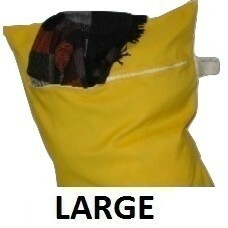 Two Large bags are better for balancing the load in your washing machine than one XL bag, however XL is now available. When washing dog bedding, the course dog hair often leaves dog hair in the washing machine and blocks both the machine filter and drains, leading to damage to the machine and possibly flooding. The following washing load is also contaminated with hairs. This filter bag provides the first line of defense in trapping most of the hair in the bag. In order to wash properly, small amount of hair may escape. Shorter, finer hair is more likely to escape the bag, however this is also less likely to be a problem. Washing numnars has always been a problem as the course horse hair gets trapped inside the washing machine and cause both damage to the machine and drainage. This bag was originally designed for washing horse numnars as it traps most of the hair, which is easily shaken out after washing to reduce damage to the machine and contamination of the next washing load.